ABC will again be broadcasting the City of Sydney’s New Year’s Eve event and is inviting kids aged 16 and under to design their very own fireworks, which will be brought to life. The winner will also get to be part of the ABC’s broadcast, pushing the ‘start button’ on the 9pm family fireworks display that will feature their unique firework design. ABC Director of Television, Richard Finlayson, said: “New Year’s Eve is such a special moment in the year and we’re always thrilled to share with millions of viewers around the country through ABC TV. City of Sydney CEO, Monica Barone, said the competition was a wonderful opportunity for a budding young artist to join a very special night. To enter, kids are invited to let their imagination explode and draw a unique firework design. The design demonstrating the most creativity, effort and potential to be reproduced as a firework display, will be announced the winner. 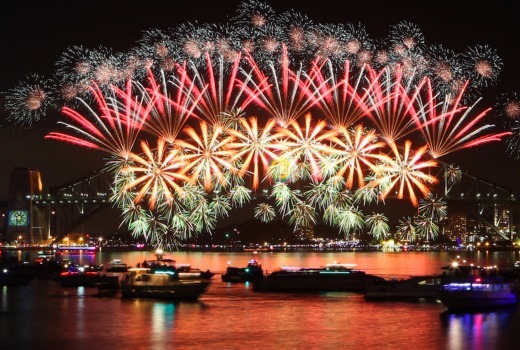 The winner will receive a trip to Sydney for a family of four that includes tickets to the Sydney New Year’s Eve official Dawes Point viewing area and the chance to be part of the live ABC NYE broadcast at 9pm. The winning design will be brought to life by Foti International Fireworks, the company that has delivered Sydney’s spectacular New Year’s eve displays since 1997. Master pyrotechnician Fortunato Foti says bringing a child’s firework design to life is an exciting challenge. “It’s not everyday you get to design a new and original fireworks display, and I love seeing what kids’ imaginations come up with,” said Mr Foti. His advice to would-be firework designers is to look at the sky as a blank canvas. Entries close 5pm (AEST) Monday 29 August. You must be under 16 years of age to enter. Great idea to get the kids involved. Hope the pub quiz returns for the broadcast.